This entry was posted in "Four legs good", Random Stuff and tagged Angel's Trumpet, Briar Rose, Floral Curiosities, Ineke, Nouvelle Etoile, Poet's Jasmine, Scarlet Larkspur, Sweet William, Tete-a-Tete. Bookmark the permalink. Live in USA. The collection sounds fascinating – thanks! Wow, that’s an interesting story about your teenage crush. I have to say that those book-like packagings from Ineke look lovely and extraordinary, unfortunately those scents don’t work for me. I find them too simple and rather girly, so no need to enter me in the draw. I’ll count you as Yes: since it was you who chose the scent, it still counts. I agree with “simple” and “girly” but I think they are good for what they are and in their price range. What a touching story by way of prelude to introducing this sweetest of gift ideas. Strangely, on twitter this week there has been some conversation as to ‘Russian perfumes’, and now here you present us with a very real one (albeit from a time passed). Thank you so much for sharing that sliver of youthful romance and reminding me about these literary scents! The Dandy resides in London in the United Kingdom, and must confess to giving perfume quite incessantly as a gift… by happenstance I bought four bottles only yesterday to be given as part of the forthcoming festivities! Dear Dandy, thank you for reading and participating in the poll. I do not remember much about Russian (or,rather, Soviet) perfumes since I had a very little exposure to those: you couldn’t try those at a store and my relatives, mostly, wore French perfumes. Your vote is counted as Yes. I had cousins who honeymooned in Moscow and some other pasts of the Soviet Union, Leningrad, the Black Sea I think way back in the mid 1980s. They spoke of the opulence with which they were greeted everywhere, great buffets at every meal, department stores opened apparently just for them, marble metro stations and incredible palaces of culture. But also of an awareness that these places were very empty, filled only insofar as they were, by people who seemed to speak very correct English and French and had little to say beyond the wonders of life under the Workers’ Republic. How quickly, in some quarters. memories of this entirely different world have slipped away. My grandmother meanwhile holidayed in Yugoslavia (as it then was) Hungary and Poland before the fall of the iron curtain. She found all three beautiful but noted how much freer and happier those in the Balkans seemed. She lived to see her beloved Dubrovnik bombed, which quite broke her heart. Everything you describe sounds very familiar: I either saw that happening or learned about it later. Soviet Union was great in putting up façades. I am a serial perfume gifter, and have even been the receiver of same recently with fabulous luck. Jin’s friends expect perfume from us as gifts now and rub their hands together when we give them packages. I live in Sydney Australia but DNEM please as I have 3 bottles of this lovely Ineke line already. I loved this story and would appreciate being entered into the draw. I give gifts of fragrance regularly. My children each receive a bottle of something (carefully considered for their tastes!) each Christmas. My husband regularly benefits as well. Looking forward to following your blog! I neglected to include that I live in the US. So, Yes on perfume giving. I’ll put you down as No on gifting. Hi Undina! Yes, I actually often give perfumeas a gift. I know it’s risky, but among my friends and family, I’m considered somewhat of an expert. They have trusted my judgement. Most recently, I bought my sister-in-law Faith Hill for Christmas last year, a couple of body sprays for het birthday in August, I gave my mother-in-law the newest version of EL Pleasures for Christmas last year and No.5 Eau Premier for her bday in May, and I just gave my niece Coco Mademoiselle for graduation. All of them adore the scents I chose and do wear them every day. My sister-in-law has asked that I give her perfume more often, as she’s not sure what to get and has really liked my selections. I often choose perfume for my mother-in-law as she loves almost anything and uses it up. It’s a guarantee pleaser. In fact, perfume was the first Christmas gift I gave her when my husband and I were dating, I gave her the original Pleasures. I usually do not gift my family perfumes, as almost no one wears them. My mom has a lot of allergies and sensitivities, yet she always makes it a point to smell me! Curiously, I have gifted my brother a few. I say curiously, because my bro does not seem like the sort to wear a perfume – he’s heavily tattooed, pierced, and very punk. He’s the life of the party, mischief-maker, and welder. But he has gone through numerous bottles of CK Truth for men (which is gorgeous), a couple Love by Aveda, and even a bottle if classic Polo. I gave him CK Truth several years ago, and It’s his favorite. We are very very close, so it wasn’t a gamble to gift him a perfume. Annina, I loved your long reply! Thank you for sharing. Your family should be very appreciative of you. So big YES from you on the main question. I have only given perfume that I know the recipient likes. I’ve had a couple of friends over separately to sniff around in my collection and see what strikes them. I ended up giving one friend Prada Infusion d’Iris, and it has become her signature scent. The other friend is like me and not satisfied with just one scent, so I made her a bunch of 5-10ml decants and later bought her a birthday gift of L’Occitane Neroli (reformulated version). I’m in the US and would love to be entered in the draw, thanks! Stacey, I take your answer as No. It’s interesting but I got two people hooked on Infusion d’Iris – a close friend and a relative. There’s something about this perfume that captures people. So, Yes from you, TF. No need to enter me in the draw, as I own this already. I never give perfume unless the person asks for it, because my family is not into perfume, and I don’t want them to give me fragrances I don’t like. I’ve given my mother-in-law Charlie in the past because she has asked for it, and my sister-in-law asked for Jessica Simpson Fancy two years ago. And now you know why I am alone in my fragrance hobby!! I’ve never gifted someone with perfume where I didn’t know if they liked it. Because my own skin chemistry is a bit of an outlier, I have plenty of first-hand experience knowing that it may not always smell on someone the way it should. On the other hand, I LOVE gifting friends with decants made from my collection. I find that very satisfying. I’ll love to be entered in the draw, and I live in Canada. Dionne, I understand from where you come (though with some perfumes that regular, not perfumista, people wear sometimes it seems that some Jo Malone, L’Artisan or Atelie Cologne should be a safe bet ;) ). So, No from you on perfume gifting. Hi Undina! I’m in the US and have only given perfume as a gift twice- both times to mu best friend. The first time I didn’t know how she would feel about the perfume- it was Ambre Gris by Balmain. The second time I sent her one of mine that I knew she liked- Lust by LUSH. Oh, and before I really got into perfume I gave my Mom that D&G set. Connie, thank you for the answer. It still counts as Yes. I’d love to be entered into the draw, and I live in London, UK. Thank you, Joshua. I just have to clarify that today’s story is a story of my second love, the first one is just mentioned (and linked to). From your description I’d guess that the answer is No since you followed your friends’ and mother’s choices rather than making a decision on your own. No need to enter me, Undina. Just wanted you to know that I enjoyed your story about S. It reminded me of the sweetness of those romances that happen in adolescence – and especially of those romances that happened back in the day before all parts of the world were instantly connected via the Internet. Oh, the letter writing and the long distance telephone calls … those were the treats we lived for and savored because they involved a certain amount of time and energy and, of course, true desire. Glad to hear of your gifting success with the Ineke books, which are very cute indeed. And to answer your question, I used to give perfume gifts to my mom, dad and grandfather when I was young, and I still do so with sisters and nieces now, not knowing whether they’ll like the perfume in question. It’s pretty much a hit or miss proposition, but I’ve had some successes. Thank you, Suzanne. It’s nice to share a story with people who know exactly what I mean. Just a couple of hours ago we were discussing with our friend that nowadays nobody expects to get a fountain pen when asking a next seat neighbor on a plane to borrow one (he was explaining an inkblot on his jeans). Yes from you on the gifts. Is Rusty going to pick the winner? He is such a handsome boy! I love your story about your first gift of perfume. I have never given “unsolicited” perfumes as gifts; however, to the extent that someone mentions a favorite perfume, I will buy that as a gift. One year, for an element of surprise, I took 2 of my nieces to Sephora and told them to sniff away and tell me their top 3 favorites and I bought one of the 3 favorites for each of them! I live in the U.S. and would love to be entered into the draw. It’s interesting: I thought of phrasing my question exactly that way – “unsolicited” perfumes but then wasn’t sure if it would be clear enough. Ok, your answer – No. And Rusty gets a treat from you but we’ll see if he wants to help me with the draw. I live in the US (Seattle), and it would be great to be entered into the draw, thank you. Cymbaline, thank you for the input. No from you – noted. Off-topic: I just voted for a perfume called Undina over at Another Perfume Blog. On- topic: As Portia would say DNEM (great tagline for underwear elastic). The amazing thing here is the price and the handsomeness of the book which I already have and enjoy. B: If the gift was for a Perfumista then I would send them a gift certificate so they could buy as they pleased. C: If it was you I would send a Jo Malone gift certificate so you can keep up with new releases. Redeemable at the New Zealand store of course so you and your man would have to visit with a side trip to our vineyards. So No is the answer to your question. Enjoyed the love story. Maybe you outgrew the story though? I remember you mentioning the scarcity and treasure of perfume in your early years some time ago. New Zealand is on my “hopefully one day” list. I agree with your approach to fragrant gift giving. I have a variation of it: if I get somebody a perfume I buy it from the place to where it would be easy to return/exchange and give an additional sample of it so a person can try it first without opening the actual bottle so it would be easier to get somrthing else if the one I gave wouldn’t work. Ohhh! That method is brilliant, and incredibly thoughtful, Undina! That’s what you have to do when you can’t help your desire to give a perfume as a gift but do not want your friend to be stuck with something she doesn’t like :) This way it’s a win-win situation and no pressure. Only my husband receives unasked for perfume as a gift, and it’s usually because I like the smell of it on him. What beautiful packaging in those photos. I live in Perth Australia. Husband also counts! :) So, Yes from you. Thank you for the input, Jackie. Yes, I have gifted people perfume. No, I have not done so recently to anyone but those I am extremely close to and whose tastes I know very well. When I think back now of how I used to give perfume willy nilly as a teenager or young adult without thinking deeply of a person’s tastes, I cringe a little, but honestly, there weren’t SOOOOOO many perfumes some decades ago. Plus, people didn’t seem so finicky for some reason (??? ), though maybe I’m just imagining it. I still will count your answer as Yes. It’s interesting that even where you lived perfumes seemed more acceptable and easy gifts. #13 (for the draw) – let me know if you don’t like the number. It’s a good story, Laurels, thank you for sharing. I can completely understand how a Clinique Happy person would struggle with Paloma Picasso :) But at least your gift was recognized for what it was. Your answer is noted as Yes. in my pre-parfumista life (before 2011): no, except perhaps my dad who in that case must have received something like Tabac or another of those universal ‘male’ fragrances at the time (early-mid 70s). Once I became interested in perfume, I’ve given away samples to others for a RAOK w/o knowing whether they’d like them or not, but I’d rather not do that too much.. Does that count as a yes and maybe ? I’m from the Netherlands and interestingly, Ineke has Dutch roots and.. I’ve laid my hands on her most wonderful sample set (A to H). She doesn’t ship outside the USA but fortunately I could buy the set through a niche perfume store with the same voucher card service. Since my live revolves around samples, it is wonderful how thoughtful her sample sets are made : the perfect gift to people who either don’t know what to get or want variety in their life. In the distant past I was what we call ‘book worm’ but life is too busy now and internet too much of a distraction.. last book I read was Jonathan Gullible by Ken Schoolland, another person with (distant) Dutch roots. 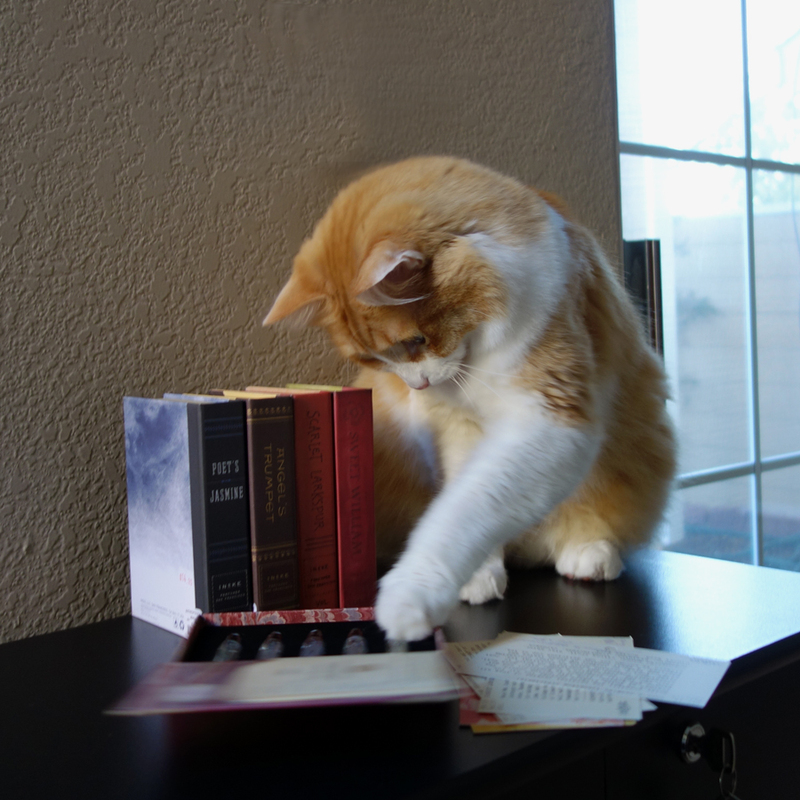 PS: read your lovely intro on FFF and adore the cat pictures..
Yvana, thank you for commenting. I’ll count your answer as Yes but not for the samples but forgifts for your father. I have gifted perfume on several occasions, and had good success with it. A good friend will get a bottle this Christmas too, she’s in Switzerland, so it isn’t an option to swap it, but I feel fairly confident she’ll like it. However I only make scented gifts if I have a special idea for a perfume for someone, I don’t go looking for perfume to gift to people. Looking forward to your statistics. Hi Undina, this is a great story and draw. I have only bought perfume for my Mum so far but I can’t wait to buy something for my boys when they’re a bit older (they’re only 6 and 9 so that won’t be for a while). I definitely like the idea of a voucher / gift card from a great store and your idea of a sample to go with this is brilliant (so I just may use that technique in the future). I live in France and yes please enter me in the draw. Hi Megan, thank you for the input. I hope your boys will grow up loving perfumes. Yes from you on the gift giving. Wonderful story dear Undina about S. You know how I love a good love story! And a first love story with perfume. I am in heaven. 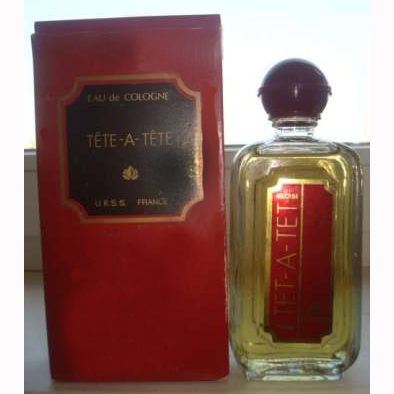 I am going to see if I can find a bottle of Tête-à-Tête (I have always been curious about Russian perfumes) As for the Scent Library by Ineke I have my volume and I love it. I almost did a review on it today but another perfume grabbed me. I will be doing it down the road a bit. Loved the post. Thank you, Lanier. I’m glad you liked my story. Right now eBay has only a current version but if I see a vintage one (it appears from time to time) I’ll let you know. How about telling me about gifting others with perfumes? I have given my mom perfume that I wasn’t sure she would like but, as a fellow perfume lover, I don’t think it was a big risk. I love your story! I live in the UAE. The Scent Library set looks cute indeed and I love the story of your long distance relationship. You have broken a whole seam of memories for me of visiting libraries as a kid – including mobile libraries – I had forgotten all about the little pocket and the library cards but it was all just as you describe! Vanessa, I think those were different times for everybody. But as least we have stories to tell. I live in Australia and would love to be entered into the draw. Thank you for the interesting story. 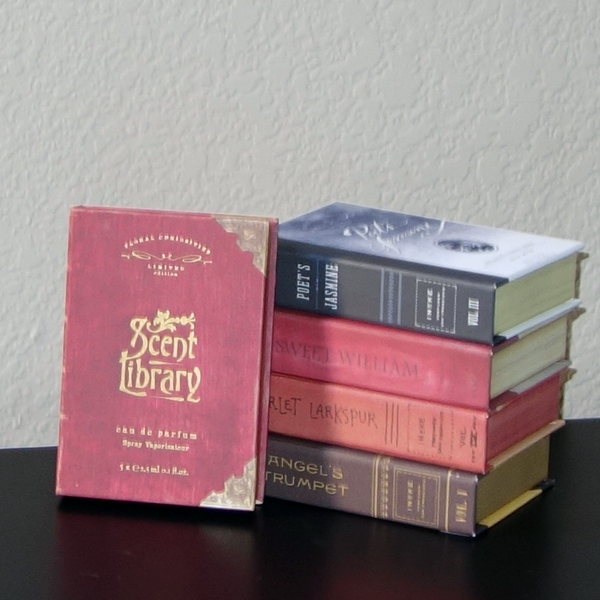 The Scent Library set does look very attractive. I haven’t given perfume to anyone who hasn’t requested it as far as I remember – it’s always possible I did when I was much younger but have forgotten! Most people I know aren’t into perfumes – some are even sensitive to them – and I do feel it’s such a personal choice anyway that I’d really hesitate to do so. (I have sometimes sneaked a surprise sample or decant into someone’s package when sending another decant but I don’t think that counts!) I have gifted full bottles to my daughter of perfume that I know she loves. But if it’s about unrequested perfume, I guess my answer has to be No. Roslyn, thank youfor reading and for the answer. No from you on perfumed gifts. ah, you know what, I have also given scented lotions and the like – bath and body works type gifts- for people I did not know very well or did not know their scent preferences. Work colleagues and such. In fact that is a very common gift from me. But it’s a bit different than buying a more expensive (department-store-priced) perfume. Last Christmas I also gave my sister-in-law (who is 13) a Sephora sampler set that allowed her to redeem it for a larger size bottle. So she got her choice of anything in the set. I didn’t know if she would like any of the perfumes specifically but I knew she liked scented lotions, body sprays, etc. (she had a few Bath and Body Works products in her bathroom when we visited). I have also given her scented lotions/shower gels in the past as well. Sephora sampler also counts since it comes with an option of a pre-paid full bottle. Do you know which one she ended up getting? I don’t – I’ll ask her when I next see her! Susan, thank you for participating! Hi Undina – as always, enjoyed the insight into your early years in Ukraine. Fun to hear about your experiences there. 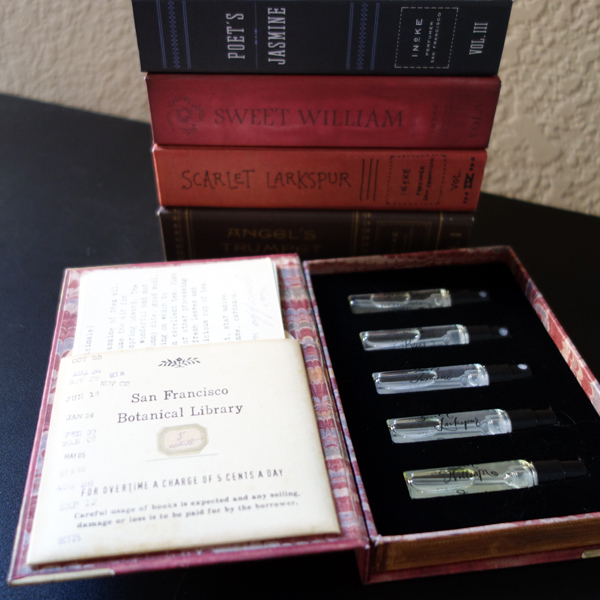 I already have Ineke’s Scent Library – glad you’ve turned me on to Ineke’s perfumes. In fact, I am wearing Angel’s Trumpet today. Still trying to decide which fragrance from the collection I want to get a full size bottle of. I am mainly leaning towards Poet’s Jasmine. To answer your question – Yes, I have gifted perfume not knowing if the recipient liked or wanted that particular perfume. I don’t do this often, as perfume is such a personal preference. As Susan posted above, my significant other has mainly been the recipient of unsolicited perfume/cologne purchases, and he generally will wear anything I buy him. For stat purposes, I live in the US – no need to include me in the draw since I have the Scent Library – seriously considering getting some as presents for some family/friends – ones I know that enjoy reading and enjoy wearing perfume. Thank you, Juli! I’m so glad it worked out for you. I think Ineke’s sets are things on their own, even if they don’t turn into a full bottle purchase. And if they do – even better. I count your vote as Yes (it’s the act of gifting that counts; the fact that the recipient isn’t too finicky is a bonus :) ). And I love the concept and packaging of the Ineke’s perfumes- though when I briefly tested her perfumes none of them grabbed me..I should probably revisit them. I LOVE gifting perfume..Usually the recipients include my mom, my sister and my mil. Unfortunately, except for my mom, the recipients are not as enthusiastic about perfume as I’d like them to be. I remember those library cards and pockets..ahh I love libraries.. I would suggest giving your sister a Scent Library book and then later, when she tells you which one she liked the most, use a $22 coupon to get a full bottle (not a travel spray): this way your sister will get both – a cute book and a perfume she’ll enjoy wearing. yep- makes sense..I’m not usually tempted just by packaging but these are just so cute!!! Any that you think I might like? (just as reference for the future? though if I do get these for my sister I can test them out hehe..) the 15 ml sprays don’t come with the library card do they? I have to tell that, in my opinion, it’s almost impossible to get anything that will compare favorably to Ta’if – not only from this collection but in general. But if you expectations are on the proper level, I can tell you which ones I like more: Poet’s Jasmine and Sweet William. Yes from you on the perfumes as gifts. Oooooh! I hadn’t seen that new (well, for me ;-)) book packaging Ineke was doing! Where’s my credit card?! I won’t be giving fragrances as gifts this year. Sorry, gotta work on the ol’ reading comprehension. Oh, I confess shamefacedly that I have given perfume as a gift without OK’ing it with the recipients. As I never got feedback from them about it, I took that as a sign that they wouldn’t want me to do it again! Lesson learned. More cute small things! I like the little library set. And I enjoyed hearing about the past perfume too. I am always curious about the obscure fragrances I see on the shelves, from Spain, Poland, and other countries that seem to have less perfume production than the US, France, etc. Unfortunately, those obscure fragrances are also usually the ones that don’t have testers; so the only way to know what they smell like is to blind buy. I was so busy that I’ve just got to the statistics post – so you still made the cut both for the stats and for the draw.